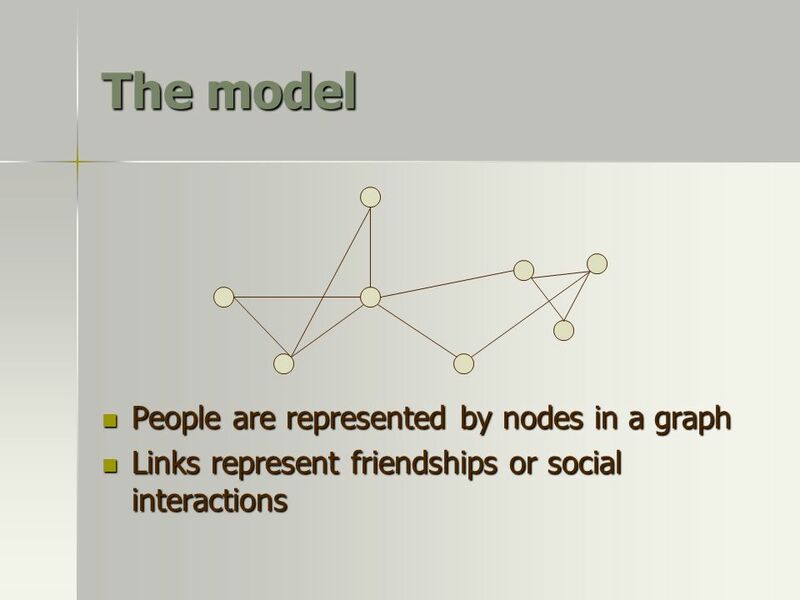 7 Coordination game Players: node of the social network Players: node of the social network Strategies: Each player chooses which technology to use (e.g. 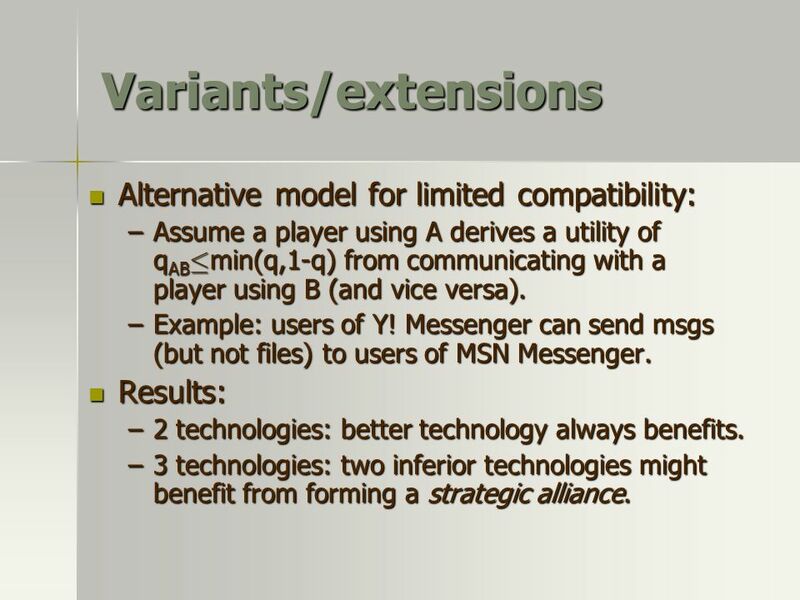 : A=Y!Msgr, B=MSN Msgr) Strategies: Each player chooses which technology to use (e.g. 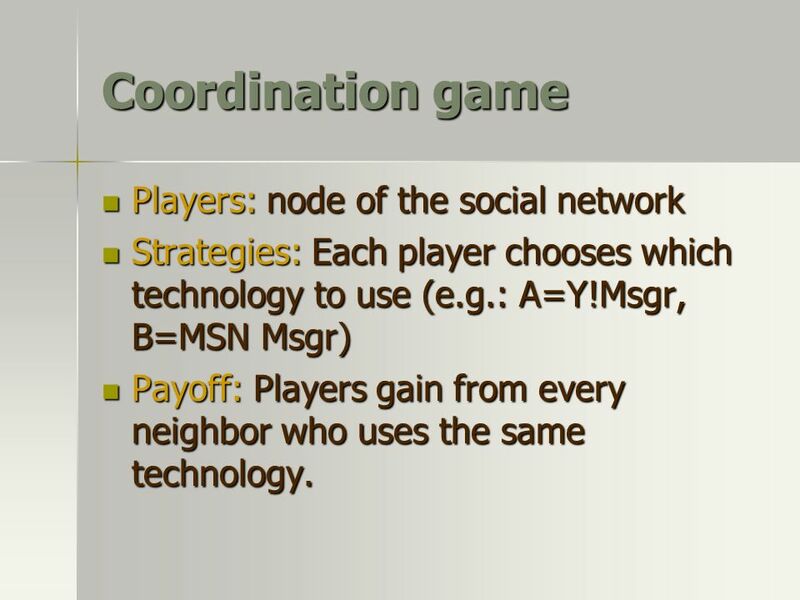 : A=Y!Msgr, B=MSN Msgr) Payoff: Players gain from every neighbor who uses the same technology. Payoff: Players gain from every neighbor who uses the same technology. 10 Equilibria This game has many equilibria, e.g. an all-A and an all-B equilibrium. 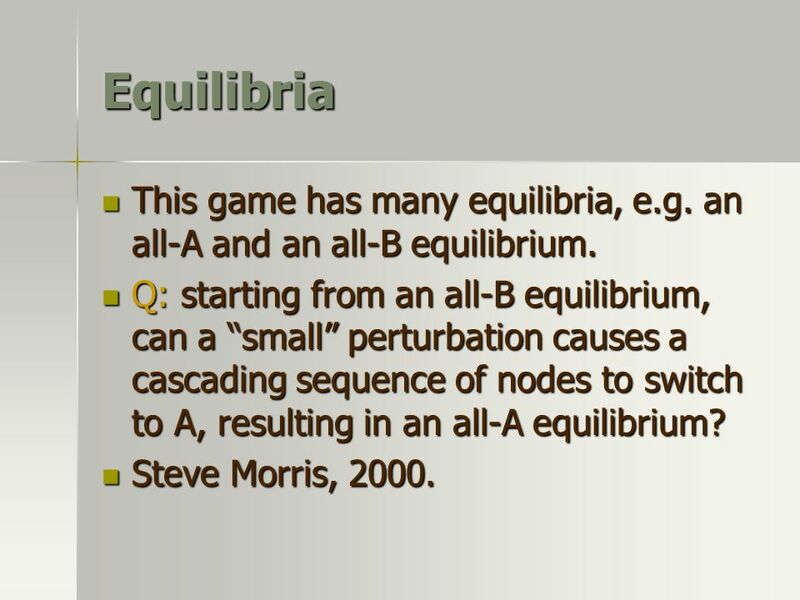 This game has many equilibria, e.g. an all-A and an all-B equilibrium. Q: starting from an all-B equilibrium, can a small perturbation causes a cascading sequence of nodes to switch to A, resulting in an all-A equilibrium? Q: starting from an all-B equilibrium, can a small perturbation causes a cascading sequence of nodes to switch to A, resulting in an all-A equilibrium? Steve Morris, 2000. Steve Morris, 2000. 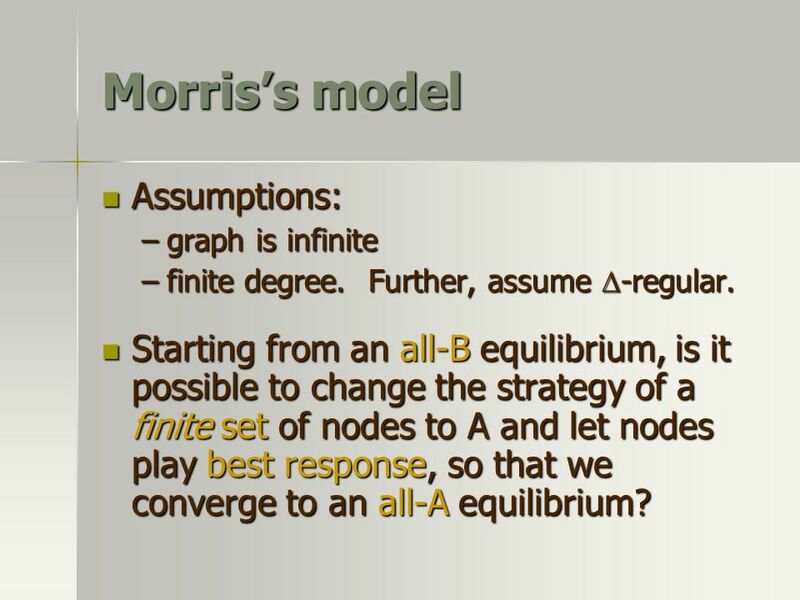 11 Morriss model Assumptions: Assumptions: –graph is infinite –finite degree. Further, assume -regular. 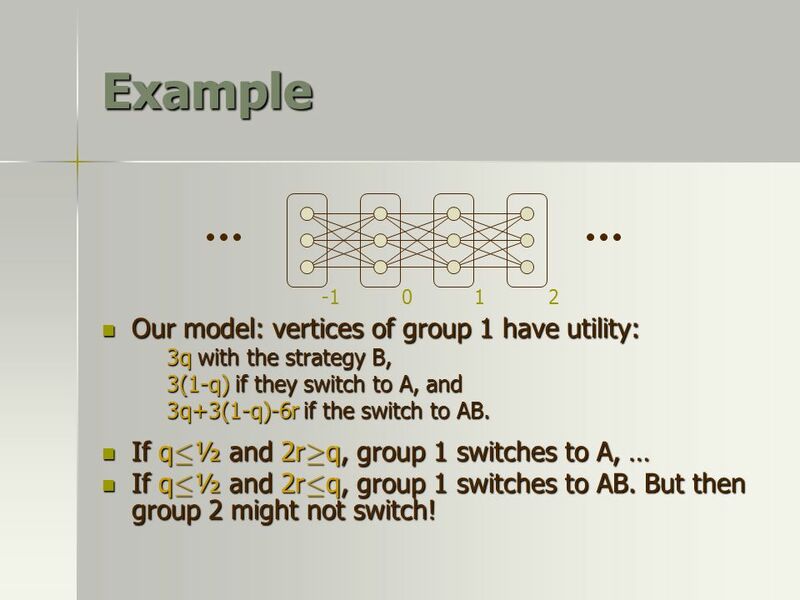 Starting from an all-B equilibrium, is it possible to change the strategy of a finite set of nodes to A and let nodes play best response, so that we converge to an all-A equilibrium? 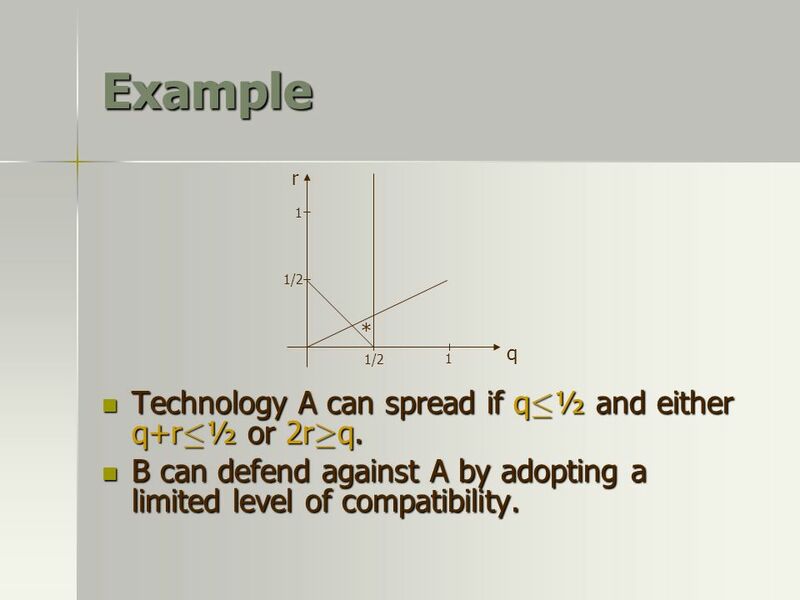 Starting from an all-B equilibrium, is it possible to change the strategy of a finite set of nodes to A and let nodes play best response, so that we converge to an all-A equilibrium? 21 General graphs Q. 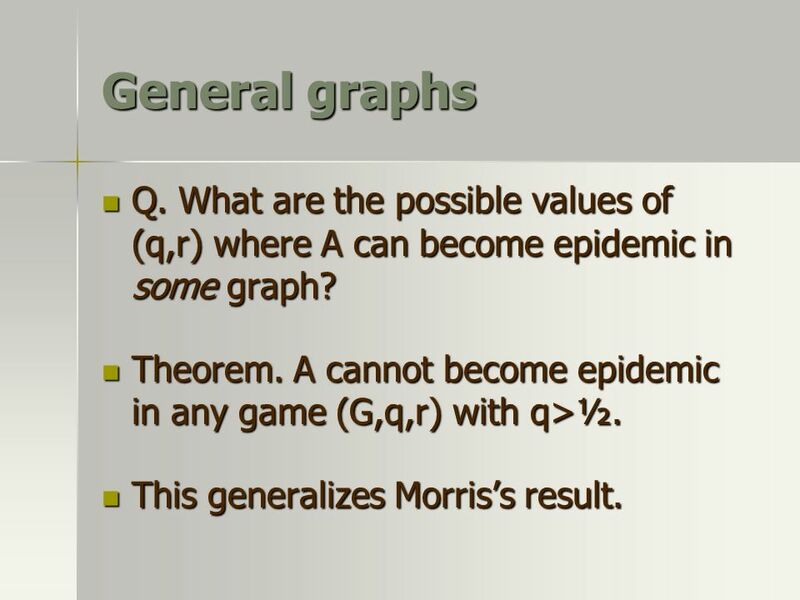 What are the possible values of (q,r) where A can become epidemic in some graph? Q. 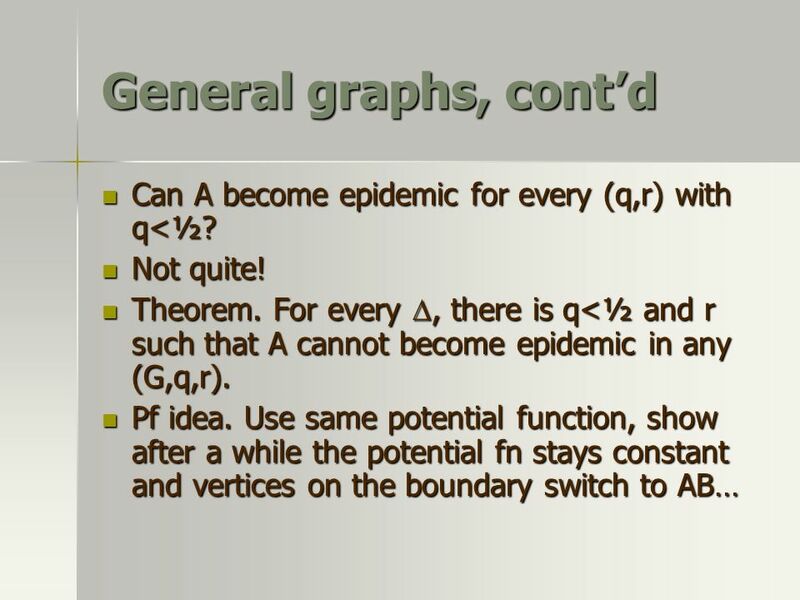 What are the possible values of (q,r) where A can become epidemic in some graph? Theorem. 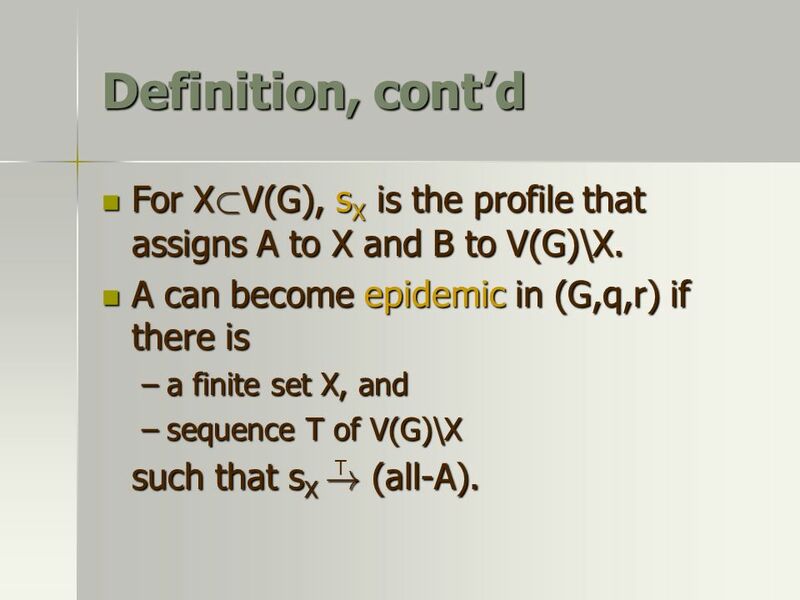 A cannot become epidemic in any game (G,q,r) with q>½. 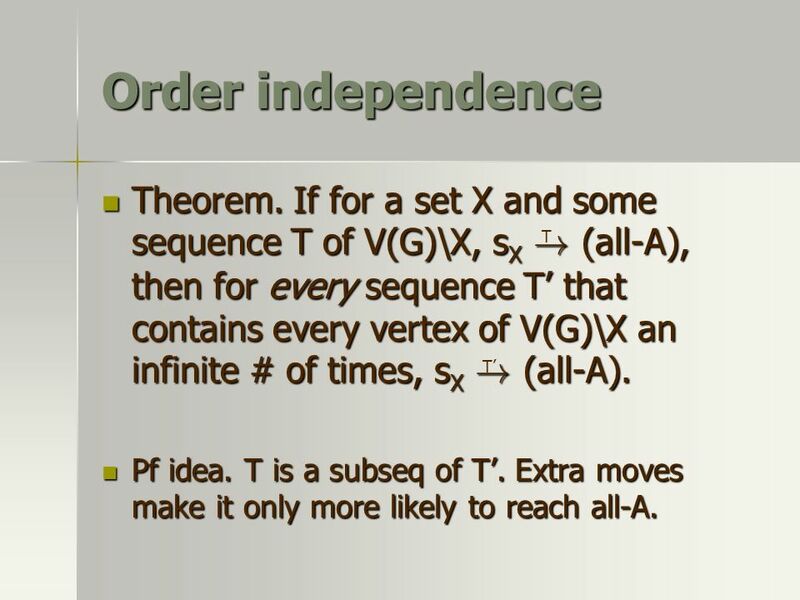 Theorem. 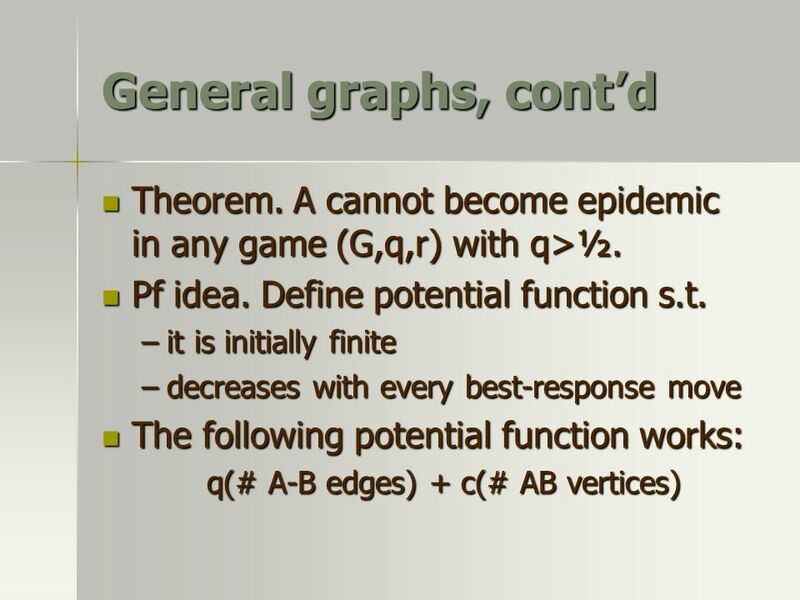 A cannot become epidemic in any game (G,q,r) with q>½. 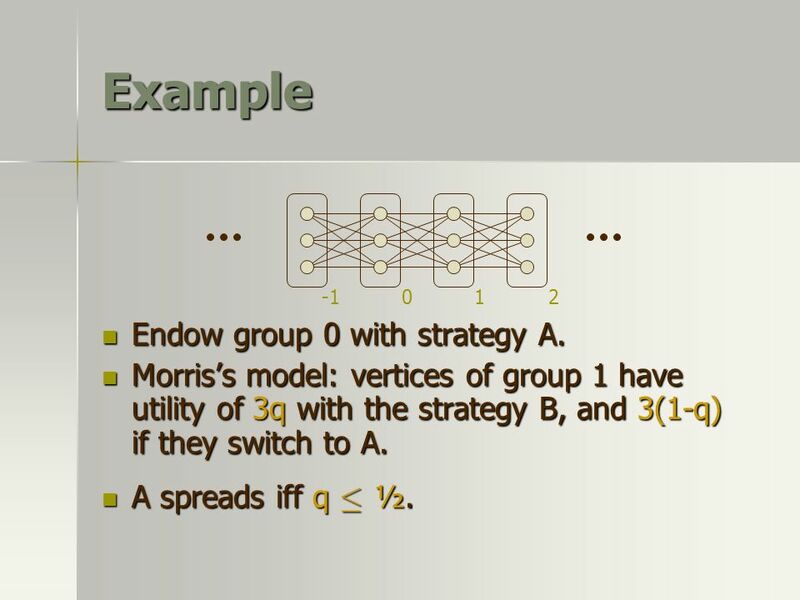 This generalizes Morriss result. This generalizes Morriss result. 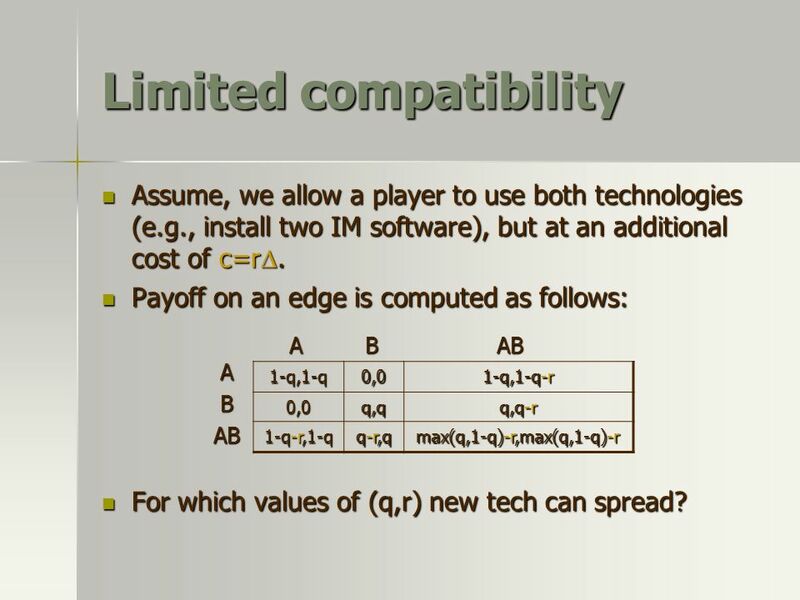 24 Variants/extensions Alternative model for limited compatibility: Alternative model for limited compatibility: –Assume a player using A derives a utility of q AB · min(q,1-q) from communicating with a player using B (and vice versa). –Example: users of Y! Messenger can send msgs (but not files) to users of MSN Messenger. Results: Results: –2 technologies: better technology always benefits. 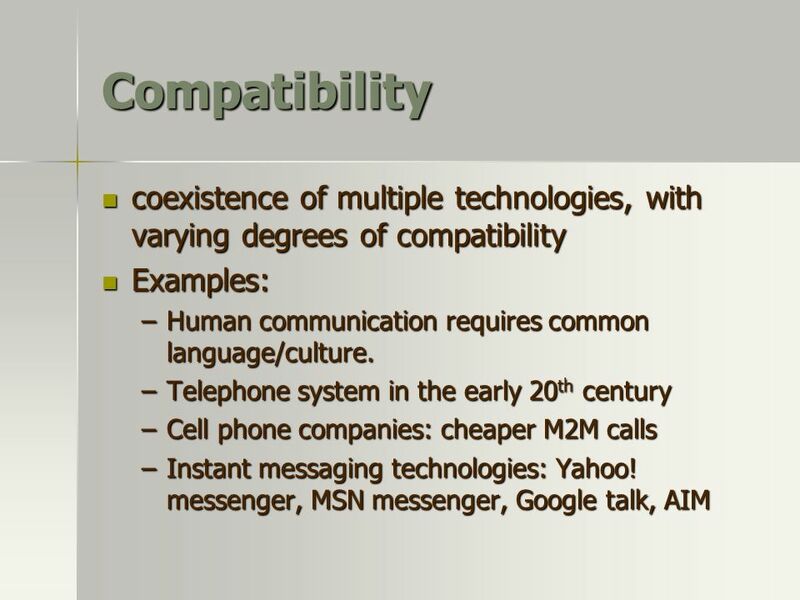 –3 technologies: two inferior technologies might benefit from forming a strategic alliance. 26 Open questions More realistic models – e.g. 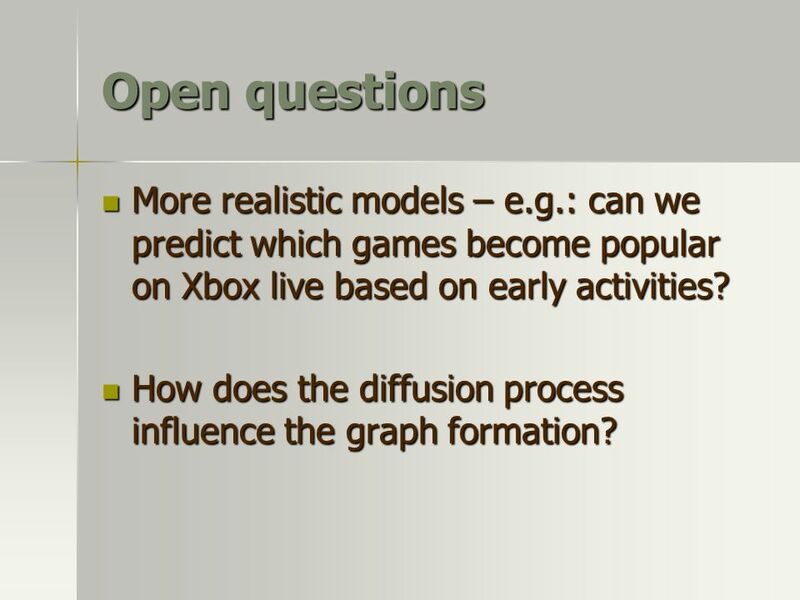 : can we predict which games become popular on Xbox live based on early activities? More realistic models – e.g. : can we predict which games become popular on Xbox live based on early activities? How does the diffusion process influence the graph formation? How does the diffusion process influence the graph formation? 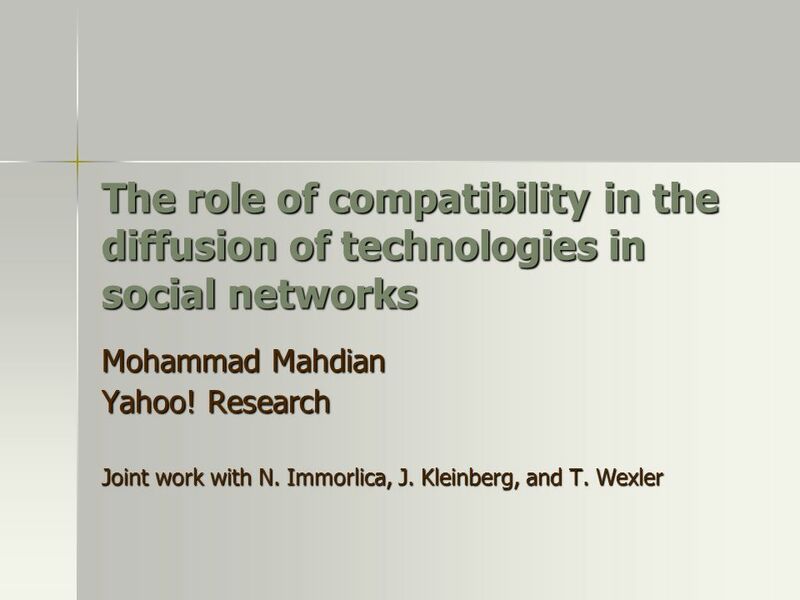 Download ppt "The role of compatibility in the diffusion of technologies in social networks Mohammad Mahdian Yahoo! 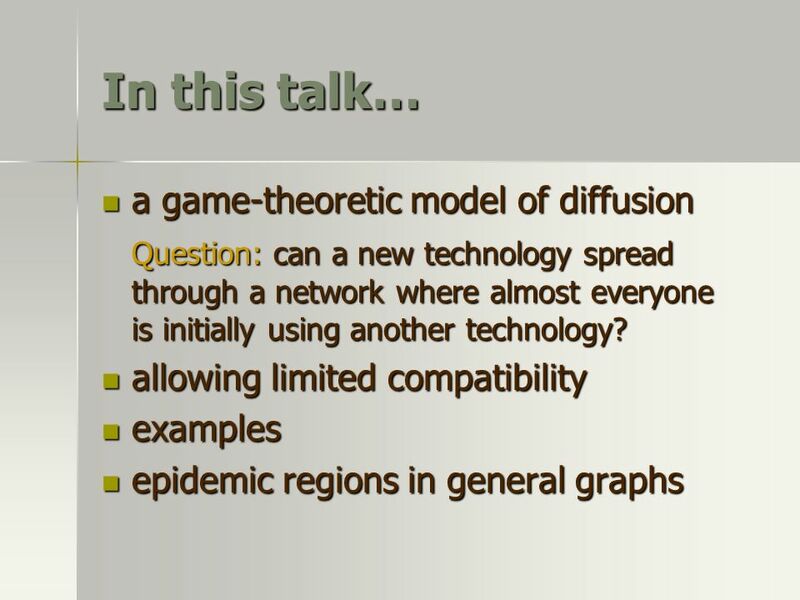 Research Joint work with N. Immorlica, J. Kleinberg,"
Diffusion and Cascading Behavior in Random Networks Marc Lelarge (INRIA-ENS) Columbia University Joint CS/EE Networking Seminar June 2, 2011. Inefficiency of equilibria, and potential games Computational game theory Spring 2008 Michal Feldman TexPoint fonts used in EMF. Read the TexPoint manual. Congestion and crowding Games Pasquale Ambrosio* Vincenzo Bonifaci + Carmine Ventre* *University of Salerno + University “La Sapienza” Roma. 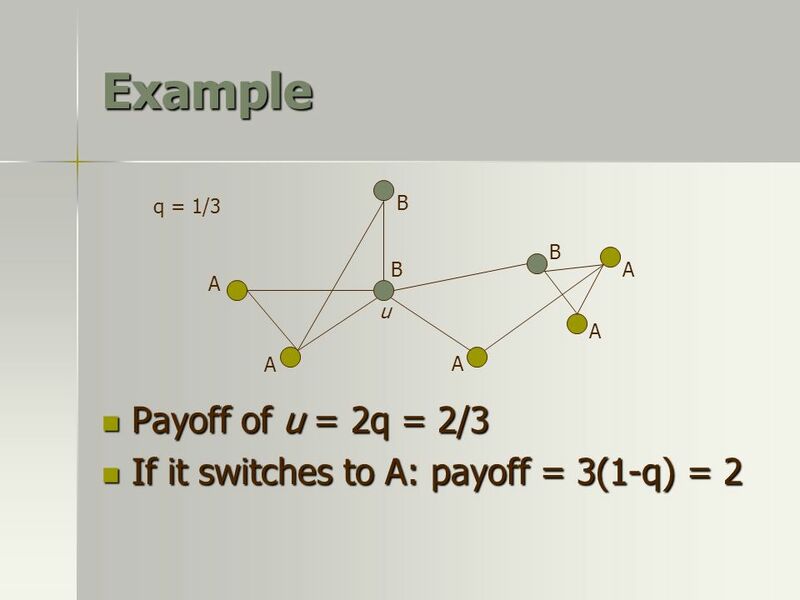 1 A Graph-Theoretic Network Security Game M. Mavronicolas , V. Papadopoulou , A. Philippou  and P. Spirakis § University of Cyprus, Cyprus  University. 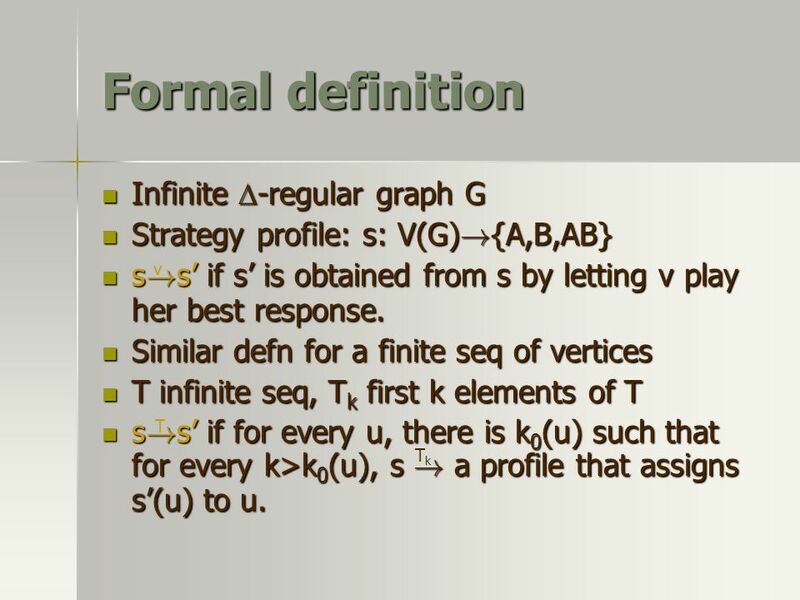 How to Schedule a Cascade in an Arbitrary Graph F. Chierchetti, J. Kleinberg, A. Panconesi February 2012 Presented by Emrah Cem 7301 – Advances in Social. Midwestern State University Department of Computer Science Dr. Ranette Halverson CMPS 2433 – CHAPTER 4 GRAPHS 1. Diffusion and Cascading Behavior in Random Networks Marc Lelarge (INRIA-ENS) WIDS MIT, May 31, 2011. 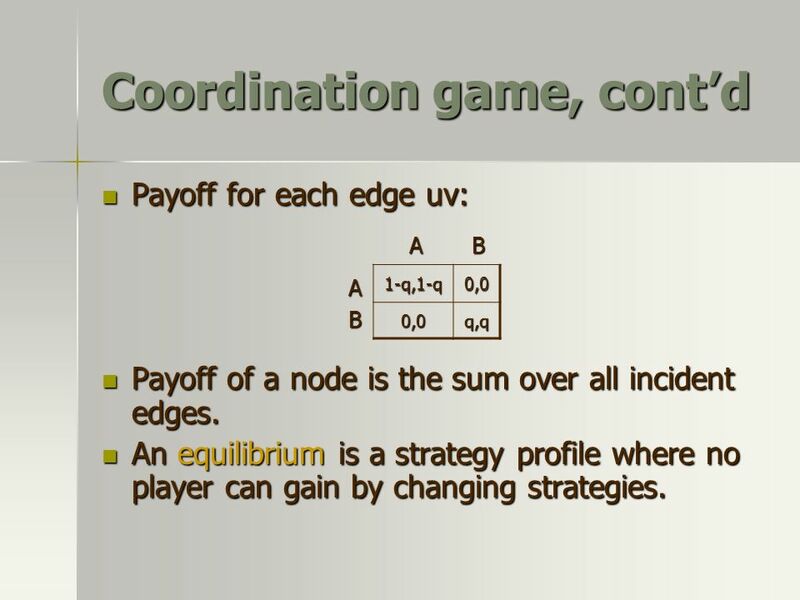 Congestion Games with Player- Specific Payoff Functions Igal Milchtaich, Department of Mathematics, The Hebrew University of Jerusalem, 1993 Presentation. 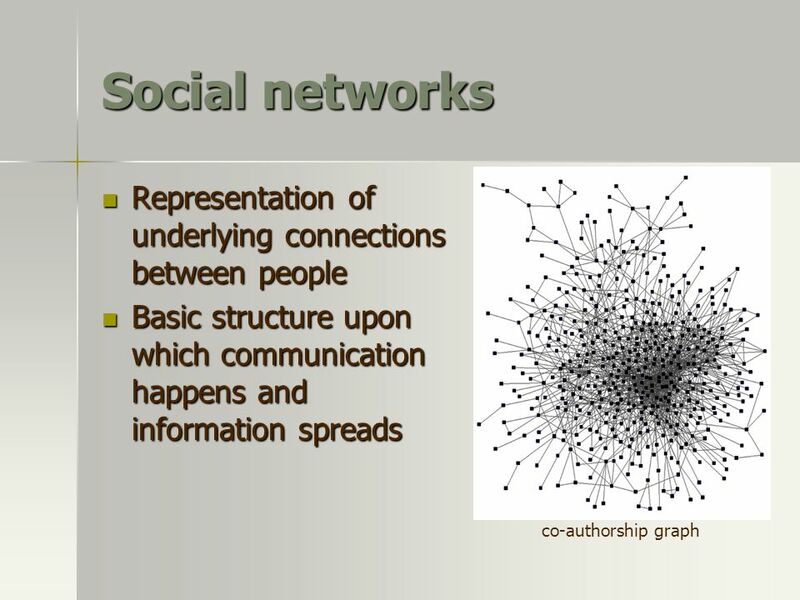 CSE 522 – Algorithmic and Economic Aspects of the Internet Instructors: Nicole Immorlica Mohammad Mahdian. 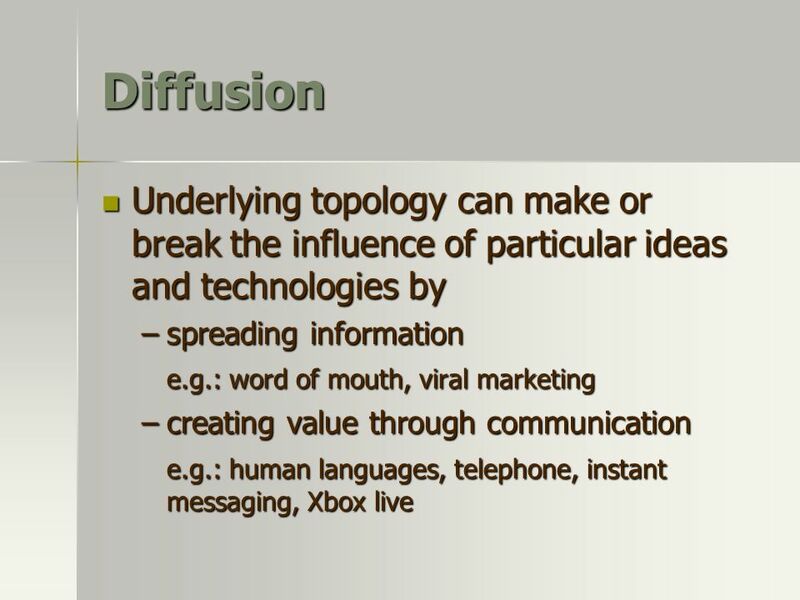 Diffusion with Compatibility Nicole Immorlica Northwestern University Joint work with J. Kleinberg, M. Mahdian, and T. Wexler. 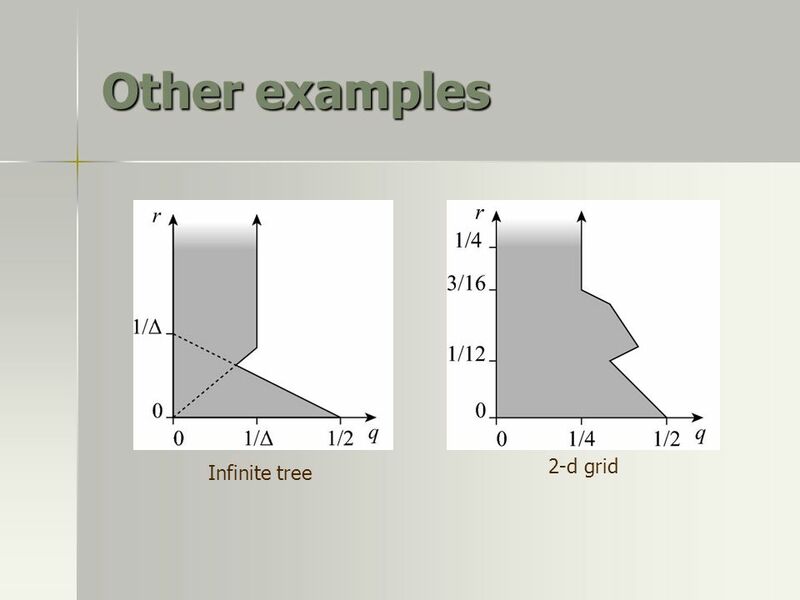 Nash Equilibria In Graphical Games On Trees Edith Elkind Leslie Ann Goldberg Paul Goldberg. A survey of some results on the Firefighter Problem Kah Loon Ng DIMACS Wow! I need reinforcements! 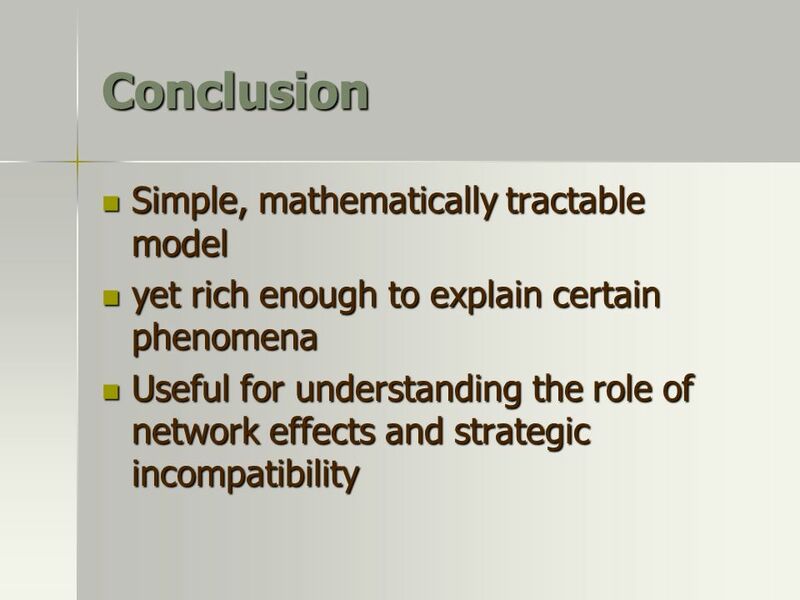 Algorithms and Economics of Networks Abraham Flaxman and Vahab Mirrokni, Microsoft Research. 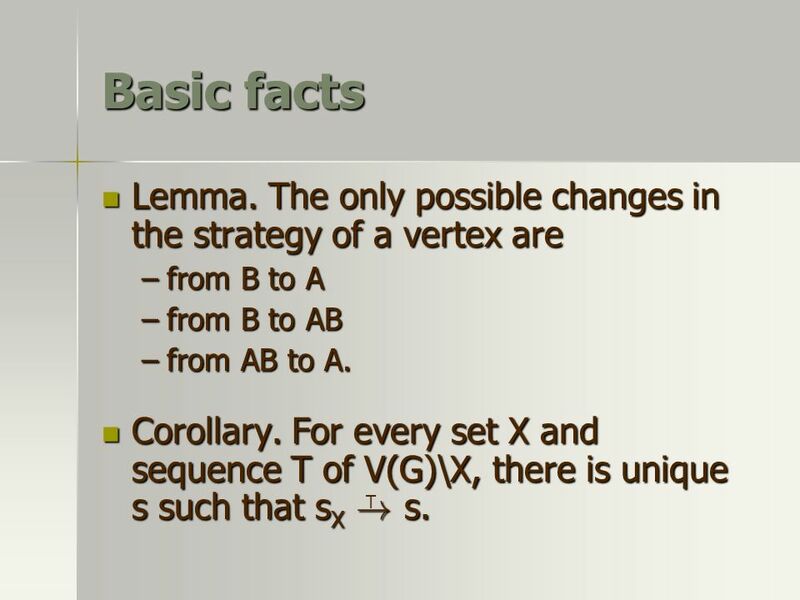 Short introduction to game theory 1. 2  Decision Theory = Probability theory + Utility Theory (deals with chance) (deals with outcomes)  Fundamental.